Posted on Mon, Mar 5, 2012 : 6:52 p.m.
A fire at Ann Arbor's Broadway Auto Care caused heavy damage Monday evening, but no one was injured in the blaze, according to fire department officials. Emergency crews were dispatched to the Broadway Street auto shop sometime around 6:30 p.m., and the fire was out by 6:50 p.m. Ann Arbor Fire Department Assistant Chief Steven Lowe said the fire was heaviest in the center and northeast bays of the shop. Lowe did not immediately have the exact time crews were sent to the scene available Monday evening. Despite the large amounts of flammable materials, such as oil and tires, in the shop, Lowe said the first responders to the scene managed to keep the blaze under control and extinguish it quickly. "It could've been a lot bigger, but the first responding crews did a great job of knocking it down," Lowe said. Two auto shop employees were inside the garage when the fire started but they managed to escape unharmed, Lowe said. Employees of Broadway Auto declined comment when approached by AnnArbor.com outside the scene Monday evening. At around 7:30 p.m., Ann Arbor police were redirecting traffic at the Broadway and Maiden Lane, and Broadway and Swift intersections. The westbound lane of Broadway was closed over the Huron River. The majority of the damage was on the northeast side of the building. One car that was being worked on was a burned out shell, while two others in the shop were damaged. The office side of the building appeared to be relatively undamaged. Lowe said it was possible that firefighters could have been working three car fires, given the vehicles that were in the garage. About half of the building was on fire when firefighters first arrived on scene, with the majority of flames and smoke coming from the roof above the center and northeast bays, Lowe said. The back of the building was also in flames, he said. Huron Valley Ambulance crews responded to the scene and remained as firefighters stripped the building of anything flammable to keep the fire from rekindling. DTE also was on scene to cut gas and power. An investigation into what caused the fire will begin once crews are done clearing the scene, Lowe said. 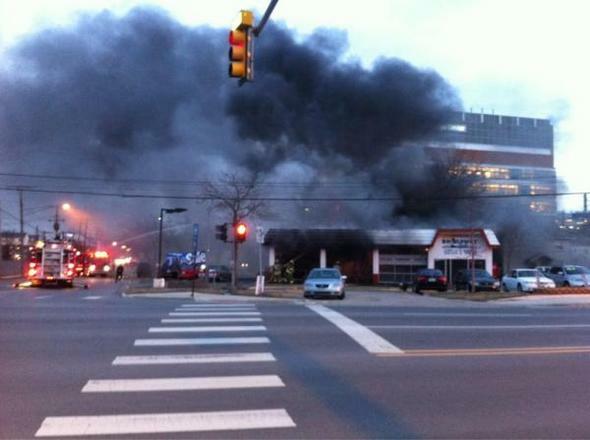 Crews respond to a fire at Broadway Auto Care in Ann Arbor. Tue, Mar 6, 2012 : 3:25 p.m.
Tue, Mar 6, 2012 : 8:41 p.m. I wonder is someone will offer them a new location, like Ziebart relocated after they had a fire. What will happen with the former Discount Tire location on West Stadium? They had four bays there, and five at their current location on Jackson Road. How many bays does Broadway Auto Care have, four or fewer? Tue, Mar 6, 2012 : 7:23 p.m.
Until a Tim Horton's or Noodles &amp; Co. are approved. Tue, Mar 6, 2012 : 2:59 p.m.
Whoops! No raise this year...I hate it when that happens! Tue, Mar 6, 2012 : 2:41 p.m. Thank you for pictures and reporting. I drove by after the fire had been put out, around 7pm. Traffic was being diverted and the eastbound lane of Broadway was closed over the Huron River, not the westbound. Tue, Mar 6, 2012 : 8:36 p.m. I was wondering about why the westbound lane would be closed, but not the eastbound. The shop is on the south side of Broadway so the eastbound traffic is closer to it. The only reason I could figure was that the westbound lane would be closed because there are fewer roads for drivers to get onto: Beakes and Summit, but not Division. Apparently Wall Street traffic was unaffected. Moore and Plymouth Roads are the second and third options on that side of the bridge. Tue, Mar 6, 2012 : 2:21 p.m. It stinks for the people that had their cars burned up in the process, but I guess those can be replaced and people can't so it all had a good outcome in that sense. Tue, Mar 6, 2012 : 1:38 p.m.
Tue, Mar 6, 2012 : 1:33 p.m. So where are all those cute little pickup trucks with the tiny pumps on them? Remember the brain trust the city hired to make recommendations for the FD? &quot;Reduce their staff and put them in pickup trucks (rapid response vehicles).&quot; Wonder how many pickup trucks it would take to put that fire out. The city should spend another $54k for another report. Tue, Mar 6, 2012 : 12:46 p.m.
An address would be nice. The link for Broadway Auto Care goes nowhere. Tue, Mar 6, 2012 : 10:36 p.m.
Well guess what? I'm really NOT familiar with where it is located, so this is why I would like a street address to look it up in google maps. Besides, it is one of the basics: who, what, WHERE, when, why, how. Tue, Mar 6, 2012 : 1:32 p.m. It's the only auto repair and care shop on Broadway in Ann Arbor. If you've ever been on the north part of town, it's pretty obvious where it is. Tue, Mar 6, 2012 : 11:35 a.m.
Great job men and women of Blue. This could have been a very dangerous fire -- nice response time, nice time in knocking it down. I applaud you. Tue, Mar 6, 2012 : 7:13 p.m. Response time was not ideal (took 5-10 minutes from call to first responders). Once they were on the scene they were able to knock it down in about 20 minutes or so. Tue, Mar 6, 2012 : 3 p.m.
Who are you referring to as the men and women of Blue? Are you talking about the police? Tue, Mar 6, 2012 : 1:45 p.m.
Nice response time? Did you read the article? &quot;Lowe did not immediately have the exact time crews were sent to the scene available Monday evening.&quot; AA.com - thanks for asking the response time question, and please keep asking until they give you an actual answer (don't these people have computers?). With the current staffing levels it's something that needs to be monitored. Tue, Mar 6, 2012 : 3:29 a.m. I saw the fire from the bus earlier this evening and it seemed pretty bad, with flames pouring out of the windows. Although, when I called 9-1-1, the dispatcher told me that the fire had already been reported and that units were on their way, the severity of the fire suggested to me that it had been burning for some time already and, given that, I was surprised that no emergency crews were on the scene yet. Tue, Mar 6, 2012 : 7:09 p.m. I was one of the first individuals to report the fire. At the time it was only taking up a small part of the interior of the garage. Within 5-8 minutes the entire left side of the building was involved. The fire spread extremely rapidly. Tue, Mar 6, 2012 : 4:04 a.m.
Tue, Mar 6, 2012 : 3:23 a.m.
Tue, Mar 6, 2012 : 3:02 p.m.
What does this comment mean? Are you referring to Centralia PA? Tue, Mar 6, 2012 : 1:57 a.m.
Tue, Mar 6, 2012 : 8:27 p.m.
Did you ever watch and listen to a video on annarbor.com about a parked car downtown at night, being videotaped by someone in a restaurant across the street? It showed a fire start under the car and spread before the firefighters got there. When they did, they went right to where the fire started and began putting it out there before opening the hood and driver's door. I don't know how they knew where it started, but I figure that they can get an idea of where any particular fire starts well before a journalist tells us how and where one starts. Tue, Mar 6, 2012 : 1:18 p.m.
Maybe you should go to the scene and offer your expert opinions. Tue, Mar 6, 2012 : 11:38 a.m.
Why don't you wait and see what the cause might have been instead of being so negative. I challenge any individual to walk in the shoes of a firefighter when entering a fire -- maybe then they would have a more positive opinion of what is entailed when they do so. Tue, Mar 6, 2012 : 12:59 a.m.
Wow. The word &quot;appeared&quot; appears 4 times in this brief article. Did you actually talk to anyone on the scene or just make some observations? Tue, Mar 6, 2012 : 1:04 a.m.
Paprika - I made observations at first and then spoke to a fire department official once he was available. Often, firefighters are not immediately able to speak at a scene because they're busy working the fire. Tue, Mar 6, 2012 : 12:38 a.m. Thanks for the A2 news story so quickly, Kyle - it's appreciated. Keep us updated. Tue, Mar 6, 2012 : 12:33 a.m.
You make mention of every department that is there EXCEPT the Ann Arbor Fire Department. I find this interesting due to the firestorm over this departments responses lately. I guess maybe its just implied but it would have been nice to know how many units responded or something along those lines. Just an observation. Tue, Mar 6, 2012 : 2:59 a.m.
That was added after I made my comment. Tue, Mar 6, 2012 : 1:07 a.m.
Ann Arbor Fire Department Assistant Chief Steven Lowe said the fire was heaviest in the center and northeast bays of the shop. Tue, Mar 6, 2012 : 12:08 a.m.
Is that a tire fire? Those seemingly never go out.